In this article I'm going to look at the differences between two open boarding buses such as the bendy bus and the New Routemaster. Open Boarding buses officially started with articulated buses on 2nd June 2002 on Red Arrow Routes 507 and 521. Shortly after, the first main routes to convert fully to articulated buses were routes 436 and 453, early in 2003. The final route which was converted to articulated buses was route 29, back in early 2006, which makes it the twelfth route. Route 453 was the only route to have change operators from Stagecoach London to Go Ahead London with new Citaro buses whilst the remaining number of Stagecoach Citaros moved to Route 25 and various other routes. As of 2008, there were approximately 416 Mercedes Benz Citario Artics operating on 12 London Bus routes with a total daytime Peak Vehicle Requirement of 356 bendy buses. The bendy buses have a history of incidents, the most notable being where they caught fire and the media labelled them as ‘Chariots of Fire’. The cause of the fires were put down to mechanical problems on the vehicles. Before the bendy buses were in service, there had been a couple of trials, the first taking place on route 180 after London Buses loaned the former SYPTE (South Yorkshire Passenger Transport Executive) Leyland DAB back in 1992 for experimental trials. You can view the video footage of it here. The second trial was in late 2001 when six Wright Eclipse Fusion bodied Volvo B7LAs were hired from First Hampshire & Dorset to be used on route 207. In 2005 Route 207 was fully operated by Mercedes Benz Citaro Artics. The Mercedes Benz Citaro was first unveiled in 2001 at the Coach & Bus show at the NEC arena and it had Route 24 on the blinds. The bendy bus was also stigmatised by bad publicity as it was known to Londoners as “The Free Bus” because the open boarding which allows passengers to board at any door enabled some to evade the fare by not touching their oyster card. Transport for London had to recruit over 100 more revenue inspectors in order to ensure that people paid their fare and to issue fines to people that didn't. A lot of people disliked the bendy bus, however, it was liked by its regular users as it had high carrying capacity of up to 149 passengers. The bendy bus replaced three routes which were 12, 38 and 73 which was served fully by the AEC Routemaster buses. Due to the unpopularity of the bendy bus the withdrawal began first with route 507 on July 2009 which was converted to 12 metre long Mercedes-Benz Citaro buses that had standing space allowing capacity of up to 90 passengers and also retained open boarding. The last route which was served by the bendy bus was route 207 which was withdrawn in December 2011. I have written numerous articles about the New Routemaster and you can find the links to them at the end of this article above the references section. Because of this I won’t go into too much detail here about the New Routemaster project. The New Routemaster project first commenced in mid 2008, starting off with a competition titled ‘A New Bus for London’. The purpose of it was for people to participate in the design a new icon for London which contained a rear platform based on the AEC Routemaster bus. The winners were announced on 19 December 2008 and the £25,000 prize for winning the whole bus design category was shared between two entries, one from Capoco Design and a joint submission made by architects Foster and Partners. The final design of the New Routemaster bus was unveiled in May 2010 as a computer graphic design of the bus, the bus is designed by Thomas Heatherwick. Then in November 2010, the full scale mock up design of the bus was unveiled at London Transport Museum's Acton depot. From there it went on display at the LTM in Covent Garden on 28th February 2011. The manufacture for the bus is Wrightbus. The first engineering prototype was unveiled for a demonstration in late May 2011, first driven by the London Mayor, Boris Johnson. The footage of the engineering vehicle at Millbrook test ground can be seen here. The first final prototype of the New Routemaster was unveiled in December 2011 and it was sent on a tour of various locations in Outer London for use as a showcase. The first New Routemaster entered service on route 38 which occurred on 27th February 2012, by mid 2012 the route had 7 out of 8 prototypes operating the route. On September 2012, the TFL board agreed to purchase the 600 production New Routemaster buses which makes it the highest order of hybrid buses in Europe. Route 24 then became the first route to have full operation served by New Routemaster buses, which started in June 2013. As of late February 2015, there will be 12 routes in operation using the New Routemaster vehicles. Officially 87 passengers but depending on the curb weight the capacity may be around 80 passengers. Bendy bus, Stretchy Bus, Slinky Bus, Caterpillar Bus &accordion bus. The bendy bus catches fire because of mechanical problems. Another problem is that the length of the bendy bus blocks junctions on some routes. Air cooling problems during summer, computer malfunction where the bus breaks down and criticism that some routes have no 2ndcrew members where people thought it’s an open platform bus. Used to serve 12 bus routes. Each operator have their own fleet numbering. For all operators they have LT as TFL owns the fleet. But the Northern Irish registration LTZ1*** have the same number as the fleet code. 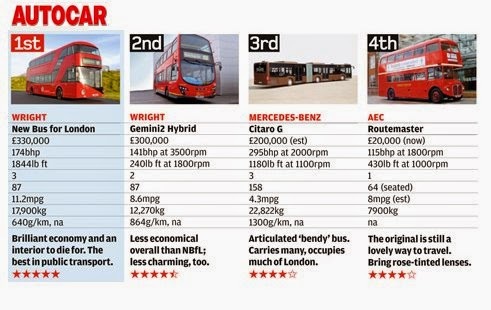 The test results of the New Routemaster and Mercedes-Benz Citaro Artic from Autocar. The articulated buses are ideal for busy routes like 207 and 25. They require less peak vehicle requirement to operate, one example being route 38; back in 2008 they had a PVR of 47 bendy buses, but currently the route uses 59 buses which are New Routemaster vehicles. It is cheaper to run but the drivers get paid more than driving the double decker rate because it requires a Bus and Trailer (category D+E) license. It is also a skill for them to manoeuvre around the narrow streets of London. There are many cities around the world that use bendy buses, mostly in Europe with their open boarding method known as ‘proof of payment’ which uses the honour system where the passengers have the responsibility of paying their own fare. With many routes served by New Routemasters, they have no 2nd crew member in place so the rear door will operate as a normal door. The bus does however retain the open boarding method just like the bendy buses provide. Depending on the service using articulated buses, the service provides conductors to collect fares, but it's only available in selected cities and towns around the world. With the New Routemaster conductors they do not go round collecting fares as there are Oyster readers for passengers to touch in, but the conductor tends to tell people to touch in. The main duties of the New Routemaster 2nd crew member is to supervise the open platform and they do not hold any revenue duties. The myth of the open platform is only strange to London because passengers like to jump on and off between stops. In the modern age, conductors are obsolete because of the Smartcard system which TFL provides to enable people to pay their fare with the Oyster Card and Contactless Bank Card. 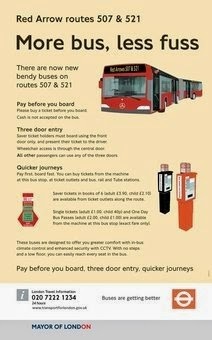 Routes 38 and 453 used to have bendy buses but they use New Routemasters now. The question is, have any of the public transport authorities and private companies around the world got their own specifically designed buses? I have found out that one city in Skopje, Macedonia does where they have Yutong City Masters built from China. They are not hybrid so they are diesel buses with a half cab design based on the AEC Routemaster. The Skopje government spent over €41 million for a fleet of 220 Yutong City Masters and 15 of them have no roof which are used for sightseeing. One of the serious issues is pollution, London is currently in breach of the legal limits of nitrogen dioxide (NO2) which is impacting on public health. The equivalent of 4,300 deaths in London is attributed illnesses caused by poor air quality. Neither the bendy bus or the New Routemaster have zero emissions. The solution to this problem is for the bus fleet to emit zero emissions and I think TFL should use Electric and hydrogen buses. But unlike the hybrid electric buses such as the New Routemaster, they are not green enough, but are a short term solution to cut emissions. The bendy buses are ideal for busy routes with big roads like route 207, and if in the foreseeable future TFL plan on reinstating the bendy buses, they should emit zero emissions like the hydrogen or hybrid diesel electric bus does. If you think the bendy buses, New Routemasters or zero emission buses like Electric and Hydrogen are ideal for London's roads then let me know in the comment section below this article. Also don't forget to share the article, thanks. Uploaded by Kobac. Licensed under CC BY 2.0 via Wikimedia Commons. Can I correct you on the Citaro artics - as the vehicle is a pusher rather than a tractor-trailer vehicle the rear axle is driven and thus a Class D licence (paradoxically) is sufficient to drive a rear engined rear driven axle bus. There is a serious safety issue which has possibly cost lives, with the Citaro artics, and that is the fact that a massive blind-zone is created on the side opposite to that direction in which the bus is being steered. This is the wedge of road space between the rear section and the line visible along the side of the front section from the external mirror (I've 'driven' a bendy bus on the Willesden simulator and noted this, and also checked this out by drawing plan views). The crucial problem comes from a sequence commencing or ending with a right turn/steering correction, such as pulling away from a bus stop, where a passenger trapped in the rear door or clipped by the rear end outswing will be invisible to the driver, or an overtaking move where the bus driver pulls in around the equivalent of 1 second too early on a cyclist, presenting the very frightening experience of the rear end of the articulated section rapidly swinging into line with the front section with the cyclist alongside. Aside from the first batch all buses had a fisheye CCTV camera mounted just forward of the rear set of doors, giving a clear view of the side of the rear section (the zone not visible through the mirrors on the outside of a tight turn, (and as the rear of the bus was leaving a bus stop). These cameras did give the driver an image, visible on a screen when the bus was stopped and rear doors open, but this was switched off when the bus was moving. There seemed to be some ignorance on the bus industry around this time about having TV screens visible to a driver when driving, and it had often to be spelled out that use of a TV screen image of views not available through mirrors, or direct sight was one of three permitted applications when the bus was moving. That recorded data would also have provided clear evidence of the validity (or not) of claimed issues relating to the articulated rear section. Pusher artics actually have some key driving techniques to remember or take account of. At low speeds and full lock turns you don't put any power on oversteer would be understating the effect. At higher speeds on sweeping bends, the dynamics of tyre scrub modify this and the effect is to get the rear section tucking in and the centre axle drifting outwards by around a foot by reported estimates. I note your commentary on the problems with NBFL and certain routes - it is proving the antithesis of the original RM in so many ways - the RM being perhaps the most manouevreable bus ever used on London's Streets with the lowest weight of bus per passenger next to the RML which in 9.15 metres of road space and a gross laden weight of 12.6 Tons carried 72 seated passengers & 5 standing, whilst legally in 11.3m of road space and at the 18 ton limit NBFL carries 62 seated passengers and 18 standing. I've not got the full details for the XML (a 5-bay stretched RM, but it looks to improve further on the weight of bus per passenger, and knock the NBFL out of the game with the passenger count? Thank you for your detailed comment which is an excellent contribution to my article. I must also thank you for correcting my errors.